If you've ever tried to work with a Microsoft Office document on a mobile device, you know that the traditional tools--mobile productivity suites such as Documents To Go and Quickoffice, or Web apps such as Google Docs and Zoho Office--are imperfect. They often lack features found in the native applications, or they mess up the document's formatting. But several new services take a different approach to helping you do real work on tablets and smartphones: They run Microsoft Office or other productivity programs on remote servers, delivering to your mobile device a version of the traditional user interface optimized for the device's capabilities. In a way, the three services I looked at--CloudOn, Nivio, and OnLive Desktop--are basically updated implementations of the thin-client concept that has been kicking around for years. (Remember Larry Ellison's New Internet Computer?) Though the idea was never a big hit in the past, the time may have finally come for that approach, thanks to the widespread availability of broadband Internet access and the rapid growth of devices that don't run Windows or OS X and have limited computing power. All three services deliver the popular Office trifecta (Word, Excel, and PowerPoint) to the iPad (some to Android devices as well). And all three have a Web-based storage component so that you can access your files anywhere (Nivio and OnLive offer storage as part of their service, while CloudOn integrates with Box.com and Dropbox). They differ significantly in other ways, however. CloudOn delivers its applications (in addition to the Office apps, it has just added Adobe Reader and a universal image file viewer) in a spartan user interface of its own design. Nivio and OnLive Desktop, meanwhile, both provide a full-blown virtual Windows desktop, including versions of Internet Explorer that support (in varying degrees) technologies such as Flash and run sites that Safari doesn't. CloudOn's user interface is the simplest to use. 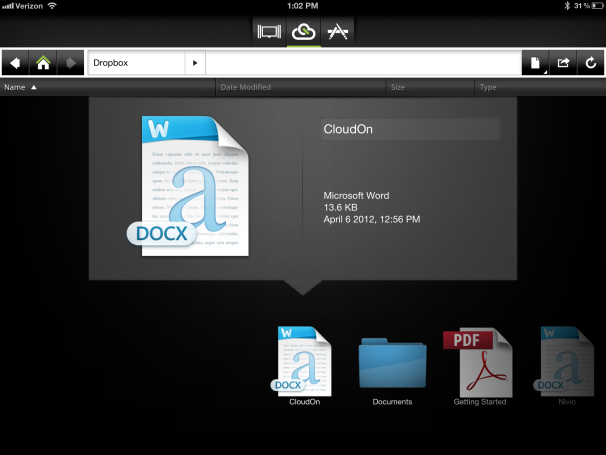 The latest release of CloudOn adds support for Adobe Reader and a universal image-file viewer. At this writing, OnLive Desktop also offers Windows' Paint and Calculator accessories, plus Microsoft Surface Collage--a touchscreen-optimized app for turning the desktop into a digital photo frame with a slew of customization options. Nivio, which is still in invitation-only beta (you can get on the wait list at Nivio's website), offers a menu of apps to which you can buy monthly access. All three services say they are working to add more applications. What Device Do You Want to Use Today? The devices these services support vary. CloudOn, at this writing, runs on Apple's iPad, but the company expects to add Android (2.3 or later) support within a month or so. OnLive supports iPads and Android (2.3 or later) tablets. Nivio can run in any HTML 5-capable browser, but it offers apps for Windows, OS X, iOS, and Android (2.1 or later) devices. You'll find differences under the hood, too. CloudOn and OnLive Desktop do all the computing on their servers. Enter a number in a cell in Excel, for instance, and the cloud servers crunch your data. The service then sends to your mobile device an interactive image of what you would see if you were running Excel on your desktop, a process that is sometimes referred to as pixel-streaming. The services' respective secret sauces lie in how they optimize the transmission of data, as well as in the adjustments required to operate a point-and-click application on a touchscreen. Nivio is a bit more complicated. On an application-by-application basis, it determines which functions are more efficiently performed in the cloud and which are better managed by the mobile device, and then hands off processes accordingly. The company believes that this highly customized approach will ultimately enable superior application offerings and performance, but it may take longer to optimize some features. For example, Sachin Duggal, Nivio cofounder and "chief wizard," says that video performance in IE isn't yet what it should be. 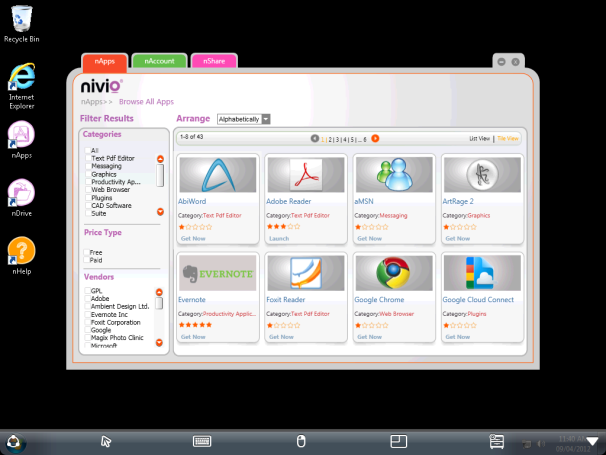 Nivio's service offers access to virtualized versions of several dozen Windows apps and applets. Prices for these services, all on a subscription basis, are in flux. OnLive is offering a basic free service with 2GB of file storage and the core Office apps, but you can't run IE or access file attachments in email without upgrading to the $5-a-month Plus service. Also, Microsoft has said that OnLive's service violates its licensing agreements. OnLive recently replaced the Windows 7 desktop with Windows Terminal Server, a move that Microsoft says is a step in the right direction. Microsoft says that the licensing negotiations continue; OnLive declined to comment on licensing issues. Whether any settlement with Microsoft might affect pricing is unclear. 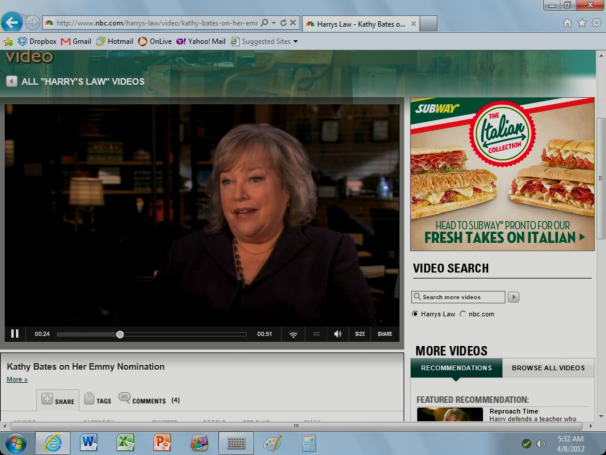 OnLive Desktop's version of IE lets you see videos on your iPad that you can't view in Safari. CloudOn and Nivio both say that they have licensing agreements for their hosting of Office apps. CloudOn is free for now, but Milind Gadekar, CEO and cofounder, says he expects to introduce competitive pricing soon. Nivio's website lists several plans that it intends to offer when it comes out of beta, all of which include free access to 10GB of file storage; basic plans start at $2 a month for 10 hours of access to its desktop service, and $15 a month buys you unlimited access. However, on top of that you must also pay subscription fees for the apps you use: For example, Microsoft Office access will cost $15 a month, and individual apps such as Word or Excel will run $7.50 a month. People who are reasonably content using free Web apps to tinker with Office documents while away from their PCs may decide that they don't want to pay for these services. But if you're hoping to replace a laptop with a tablet (preferably one with a Bluetooth keyboard) without giving up the full functionality of Microsoft's desktop software--and if broadband access isn't a concern for you--these services are well worth a look. If nothing else, they might well prove to be an attractive alternative to commercial mobile office packages. CloudOn's simple user interface, Dropbox integration, and smart tweaks make it the clear leader in bringing full-blown Microsoft Office functionality to the iPad.